So When to Use Alternate Streams? The unnamed stream is a mandatory element and is always present. If you are creating an alternate atream and the file does not exist, the system will automatically create a zero length unnamed stream. If you are deleting the unnamed stream, the system considers it as a request to delete the whole file, and all the alternate streams will also be deleted. The security descriptor and the file attributes belong to the file as a whole, not to the unnamed stream. For instance, no stream can be opened for writing if the read-only attribute is set. Note, however, that not all the attributes are file wide - some are stream based, most notably encrypted, compressed, and sparse. When a program opens an NTFS file, it in fact opens the unnamed stream. In order to specify an alternate stream, append the colon character and the stream name to the file name. That is, filename.ext specifies the unnamed stream of the file (or, depending on the context, the whole file), and filename.ext:strname specifies the alternate stream strname. A directory also can have alternate streams, which can be accessed exactly the same way as file streams. However a directory can't have an unnamed stream, and any attempt to access it (that is specifying the directory name without a stream name) will result the Access denied error. Because the colon character is used also in drive specification, it may cause an ambiguity. For example, A:B may represent either a file B in the current directory of the A: drive, or a stream B of the file A. The system always resolves this ambiguity as a drive and a name, so if you want it to be interpreted the other way, specify the current directory - in our example the path should look as .\A:B. The good news is the Windows Explorer and the command-line copy command recognize alternate streams and correctly copy multi-stream files. The bad news is the system support is limited to that. The Windows Explorer does not allow any stream operations, and if you try to specify a stream name in the command line, you will get an error. Other commands, for instance, echo, more, and type, can access alternate streams by using redirectors < and >, which are stream-enabled. MSDN alternate stream example uses those commands with the redirectors for creating an alternate stream and inspecting its contents. While these commands undoubtedly work, it is hard to imagine any practical use for this technique. Of course, you can always use FlexHEX to perform any stream operation, however a hex editor is probably not the best tool if all you want is just to copy or rename a stream. So we have developed a complete set of free command line tools for handling alternate streams. Just download and unpack them to your Windows directory. Certainly you should not use alternate streams for storing any critical information. 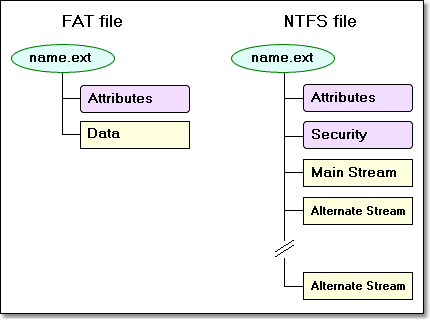 Older file systems are still widely used, and they don't support the advanced NTFS features. If you copy an NTFS file to a USB drive, flash card, CD-R/RW, or any other non-NTFS drive, the system will copy the main stream only and will ignore all the alternate streams. The same is true for FTP/HTTP transfers. No warning is given, and a user, relying on alternate streams, might get a nasty surprise. So the Microsoft reluctance to provide user tools for alternate streams is not all that unfounded. However alternate streams are still extremely useful. There is a lot of non-critical information that alternate streams is the most natural place to store to. Examples are thumbnails for graphical files, parsing information for program sources, spellcheck and formatting data for documents, or any other data that can easily be rebuilt. This way the file can be stored on any file system, but keeping the file on an NTFS drive will greatly increase processing speed. In order to improve readability, the code examples below don't include any error processing. You should add some error checks if you want to use this code in your program. See the sources in the download section for an example of error handling. You can use the Win32 API function GetVolumeInformation to determine if the drive supports alternate streams. Keep in mind that if the file does not exist, creating a named stream will also create a zero-length unnamed stream. As has been noted before, you can't delete the unnamed stream alone; deleting it also deletes all the alternate streams. Unnamed stream to unnamed stream: treated as a file operation, that is all the named streams also get copied. If the target file exists, it is replaced. Named stream to unnamed stream: also treated as a file operation, although only one stream gets copied. Existing target file gets deleted, so instead of replacing the unnamed stream as you might expect, the function replaces the whole target file with a new single-stream file. The code above is the stream copy loop used in our CS command-line tool (the error processing code has been removed to improve readability). The complete sources are available in the download section. It seems there is no way - documented or undocumented - to rename a stream short of directly modifying the corresponding MFT entry. Windows Vista introduced new functions for stream enumeration: FindFirstStreamW / FindFirstStreamTransactedW and FindNextStreamW (note that only the Unicode versions are available). Their usage is fairly simple and is very similar to the well-known FindFirstFile / FindFirstFile functions. This is the tricky one. The only Win32 API function that can be used for enumerating streams is BackupRead and using it would be a bad idea. The problem with BackupRead is that you must actually read all the file streams in order to get their names. Even if the file contains no alternate streams, you will have to read the whole unnamed stream just to establish this fact. As a result any large enough file will bring your application to the screeching halt. Fortunately there is an undocumented, but quite a reliable way of obtaining stream information using the Native API function NtQueryInformationFile (or ZwQueryInformationFile). A slightly more complex code is required if you want to open a directory. First, the program must have the SE_BACKUP_NAME privilege; second, you must specify the FILE_FLAG_BACKUP_SEMANTICS flag when calling CreateFile; and third, you must keep in mind the fact, that unlike files, a directory may have no streams at all, and so the program should recognize the situation when no stream info is returned. The function NtQueryInformationFile places a sequence of FILE_STREAM_INFORMATION structures in the InfoBlock buffer. FILE_STREAM_INFORMATION is a variable-length structure, its size is stored in the NextEntryOffset field (which can also be interpreted as the offset to the next record). The last structure in the list has zero NextEntryOffset field. The StreamName field contains the stream name in UNICODE; the StreamNameLength field is the name length in bytes (there is no terminating zero). You can remove the if (pStreamInfo->StreamNameLength == 0) check if you don't intend to process directories. A file always has at least one stream so this check is not necessary. Please note that stream names include the attribute name, that is the unnamed stream name looks as ::$DATA, a stream named alt looks as :alt:$DATA and so on. For a real life example please see the source code of our LS command line tool. The sources can be downloaded from the download section. All our stream-enabled command line tools are free and can be downloaded from the download section. You cannot distribute these tools separately, however you can distribute the original zip archive freely. will copy the file's primary stream. If the file report.txt has any alternate streams, they will be ignored (use the standard copy command to copy the file as a whole). If no stream name is specified, the command deletes the whole file (deleting the unnamed stream causes all the streams to be deleted). The command don't ask for confirmation, so be careful. The program leaves the main unnamed stream intact, but all the attached alternate (named) streams will be removed. The package also includes a batch file SFs.bat, which calls sf.exe for each file in the current directory. There is no known method of renaming a stream, so we have to use the copy/delete sequence. While this method will do the trick, renaming a large stream may take considerable time. This command lists all streams of the specified file and their size. The LS command returns the standard success code 0 only if at least one alternate stream was found. See the topic "Calling From a Batch File" below for a usage example. This batch file FS.bat can be downloaded as a part of the stream tools package. Please refer to the Windows Help to learn more about Windows batch files and batch commands. streamtools.zip - a set of command line tools for working with alternate data streams. The Command Line Tools section contains a detailed description of the tools and usage examples. streams.zip - The complete Visual C++ source code for the command line tools. These sources supplement the Programming Considerations section and can be used as reference code.